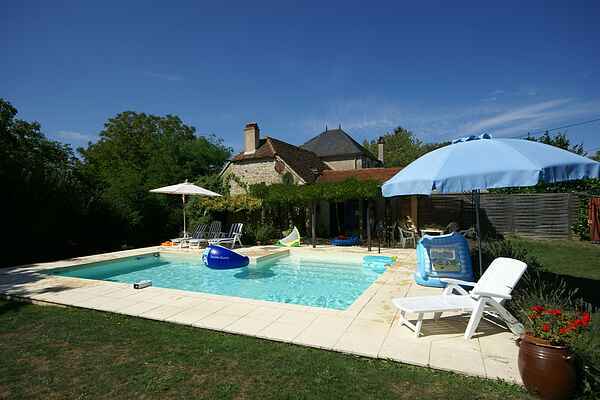 Free standing vacation home in the village of Alvignac. You'll have acceas to a large, cozy garden with lawn and private pool. The interior is well-maintained and pleasant. The bakery, where you can get fresh croissants and french bread, stores for your daily groceries and a restaurant for culinairy evenings are all located at walking distance. There is plenty to do in the aurrounding areas if you decide to make a trip outside of Alvignac. The world famous pilgrimage town of Rocamadour is only 8 km away. Just as picturesque is Carrennac (13 km) located by the Lot river. If you follow the river up stream from here, you'll reach the enormous castle of Castelnau after 9 km. Headed 34 km the other direction is the touristy town of Souillac (18-Hole golf course). Fun for the kids: zoo in Gramat (8 km) and beaches with canoe rentals in Carrennac and Gluges (14 km). You can make a day trip to Brive-la-Gaillarde (50 km). The centre is very old and has several magnificent old buildings, like the Hôtel de Labenche, the 16th century Tour des Echevins, the musée Ernest Rupin dating from the Louis XIII era and the 12th century St-Martin church.